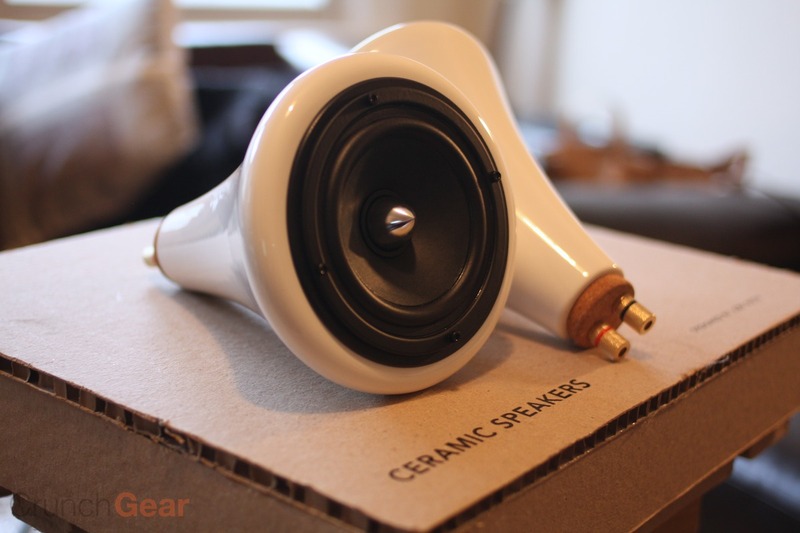 Short version: These designer speakers have a unique design and excellent sound. Their appearance may not be for everybody, and the lack of a subwoofer affects a portion of the bass, but apart from that these are a true high-fidelity audio solution. I reported these speakers way back when they were still in deep pre-production. Joey Roth, the designer, contacted me some time ago about reviewing them, and I’ve been using the speakers now for 3 weeks or so. I thought I’d better give them some time, since I have been using the same (great) Logitech speakers for some years now. Before everything, I should address these speakers’ design. Personally, I think they look fantastic. The amp especially, with the exposed brass, smooth-sliding felted wood volume knob, and understated metal finish. But beware: they are very distinctive looking and may not work with your sense of decor! Also, the wires are pink — pink like strawberry ice cream. I guess I could have done without that, but it has its charm. The first thing I found was that the speakers are much bigger than I thought they’d be. From the pictures I imagined them to be about the size of a juice glass, but the cone is really more the size of a cereal bowl. They sit on little wood stands which you assemble yourself, and the cables are serious 16-gauge stuff, connecting to a derivative of the digital T-amp that made such a splash a couple years ago. The banana plugs gave me a little trouble, but all that really did was make me understand that this was a serious piece of audio hardware, not a mass-produced plastic box with a loose 3.5mm jack stuck into it, as I am sorry to say my Logitechs’ puck is. A lengthy warm-up period is recommended, so I left them on at medium volume all day and worked from a cafe nearby. It was a little while before I felt comfortable really pushing the speakers, since in my mind ceramic=breakable and designer=not built to last. Wrong. It should have occurred to me immediately that the driver units are fully twice as wide as those in my Logitech system, which could really belt it out. Your mind is probably lingering, as mine did, on the 70Hz frequency floor. Most speaker sets, because they include a subwoofer, have a 20Hz floor. That’s great, guys, but it doesn’t mean much without real frequency response data: where does the subwoofer take over from the tweeters? Am I going to hear everything under 300Hz come from under my desk? — or perhaps the poor tweeters are overworking themselves, trying to push out 150Hz with some amount of power, and it’s leading to distortion? 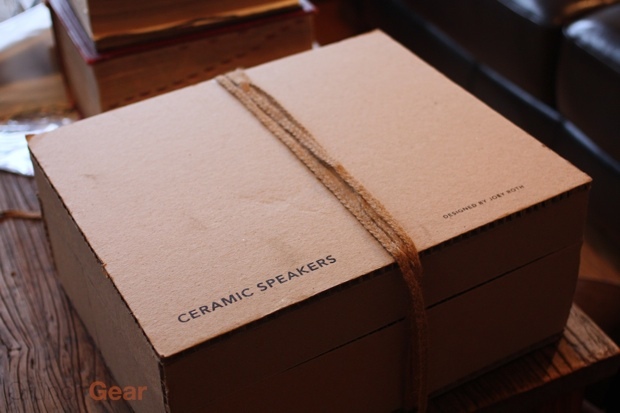 What a speaker maker needs to guarantee is that there is a smooth response all the way from the top to the bottom, and that’s what we’ve got here with Roth’s ceramic speakers. Over the last few weeks I’ve tested it out on just about every kind of music you might want to play, plus in addition to that some movies, shows, and games of various description. They sound great with everything, with a few notable exceptions: songs that truly rely on very low frequencies. I’m not talking about hip hop, or the bass in a jazz quartet or rock song — I’ve listened to plenty of those and they sound great. The truth is that the 20Hz is in the tail end of the bass spectrum, and instruments that produce it only produce it as a part of their sound. I’m sorry to lose out on it, sure, but it’s far less noticeable than you’d think. I’ve only found a couple songs that are actually broken by the lack of that frequency range, but it’s only fair to say that if you listen to a lot of heavy, low beats (some hip hop and techno artists aim at this), these aren’t the speakers for you. For the rest of us, they’re excellent. There is a clarity to them compared with my old set that reminds me of when I started using high-end in-ears instead of traditional headphones or earbuds. The tone and sound is reminiscent of the Klipsch X5s, which similarly de-emphasized the very low end and focused instead on complete and balanced sound. There’s plenty of low end to go around, and what matters is that it sounds great. The lowest lows are still punchy and strong; they don’t peter out or distort. And yes, they get loud. Yesterday I queued up a few loud songs and turned it up higher than I’d dared to before. Sounded great. And an added bonus is that, without a subwoofer, your risk of A: washing out the sound with poorly balanced bass, and B: making enemies of your neighbors, is substantially lowered. There is, however, a directionality to the speakers that creates a pretty serious “sweet spot,” although unlike, say, flat-panel speakers, the sound is still complete elsewhere, just not as loud or exact. They actually work very well for gaming as well — I’d still put on a surround-sound headset if I wanted the full experience, but the ceramic speakers produced more than enough power and stereo separation to make my second playthrough of Borderlands a joy. The directionality of the speakers means that for the best stereo cues you should make sure you’re right between the two cones. Also, if you switch between speakers and headphones a lot (if you have a roommate, say), be aware that there is no integrated headphone jack, as there often is with desktop speakers. The rise of USB-based audio makes this less of a nuisance, but it’s worth mentioning. 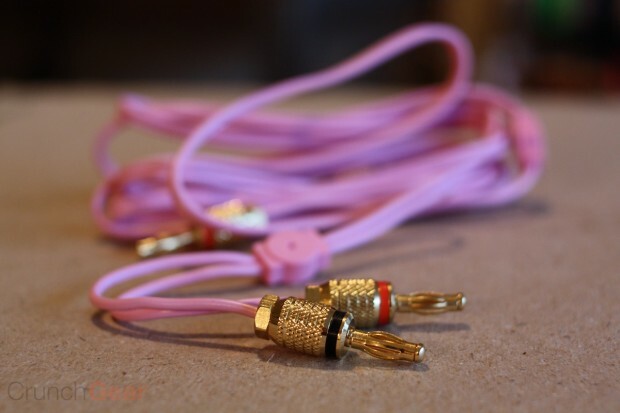 I should add that I also tested these on my record player with a pre-amp, but I don’t trust my old needle or the aging cables to give the full range of clarity. They sounded fine, but I didn’t think I should draw any serious conclusions. The part I haven’t mentioned, of course, is the price. These speakers cost $500. Now, some of you probably hissed in disappointment, and others scoffed, saying “why, that’s how much I paid for my cables!” That makes these speakers kind of a hard sell, since they’re too expensive for those of us used to paying $150 for speakers, but not quite boomy or multi-channel enough for audiophiles or home theater guys. But the truth is that I see these as the perfect speaker system for the enlightened apartment dweller. Loud, clear, and suitable for most purposes, as well as being beautiful and interesting objects. In fact, you know what these are? They’re for the person who has everything. Because they certainly don’t have anything like these.